By Joel Santana on Feb 12, 2014 - 2 Comments. 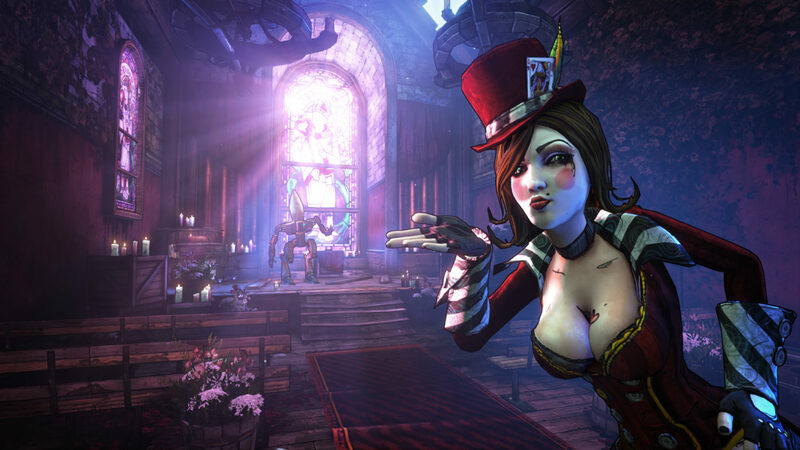 With Valentine’s Day soon upon us, Borderlands 2 developer Gearbox has decided to show their loyal vault hunters across all platforms some love in a Valentine’s Day themed add-on, Mad Moxxi And The Wedding Day Massacre. Although themed on a holiday based on love, the DLC is quite the opposite, as per the usual Borderlands twist. Throughout the relatively short campaign, you’ll get to once again fight the Hodunk and Zaford clan, who have banded together for the wedding of two of their members. 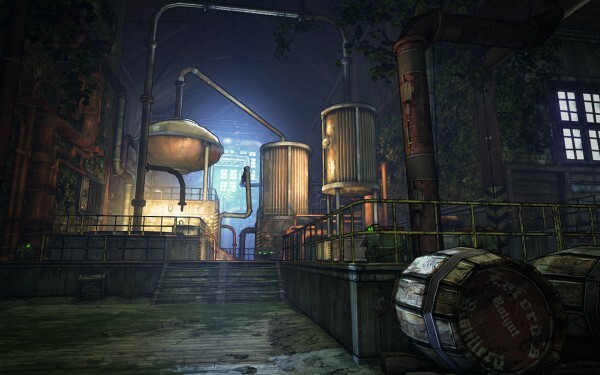 Fast traveling to Rotgut Distillery, the mini-DLC’s starting area, a gloomy greenland, you’ll be immediately be greeted by Moxxi and the unfortunate death of a couple that randomly gets struck by lighting, marking the first of many deaths in this massacre. From then on, the story has you rummaging through a Zaford distillery in the usual Borderlands fetch-and-go style quest, picking up various items to create a love potion to forcefully put Bridget Hodunk and Collin Zaford together in time for their goliath wedding and to join both clans as one. The Zaford Distillery, where most of the fighting takes place. On your quest to complete said love potion, you will run into new enemies from the aforementioned bandit clans from the Hodunk Skullsplitter and Zaford Blader, to the more menacing loader, the BLNG LDR, who is, quite frankly, just a golden super badass loader with tons of health. 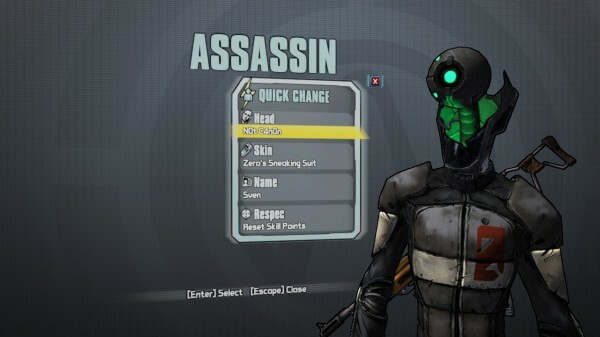 My personal favorite new enemy: a Tipsy Tresher who will have your vault hunter seeing double as anytime it hits you, it automatically gets you drunk. After a number of unfortunate events, the story brings you to the DLC’s new boss who, once disposed of, will drop a item that allows your favorite vault hunter to fish for a special type of thresher, Rue The Love Threshers. Rue is pretty much a giant thresher with a top hat on and hearts around its body who contains some pretty good loot once defeated. However, if you’ve collected the other four fishes scattered through out Rotgut Distillery (white, green, blue, and purple) and fight the associated threshers (Sigmand, Ikaroa, Moby, Fire Crak’n, and Rue), you get to put their tentacles above a red chest that nets you some pretty good loot for all of your trouble. A loot leprechaun appears in the area after awhile. Those who are on a tight budget will probably find it best that they skip on this Head Hunter pack as it feels slightly shorter than the previous ones and the end loot reward isn’t as good as the loot found in How Marcus Saved Mercenary Day. Although Mad Moxxi And The Wedding Day Massacre has its shortcomings, it does contain some of the best dialogue from the Head Hunter packs that gets you in the mood for Valentines day while offering some pretty sweet customization items that takes a stab Zer0’s true identity. Though, it should be noted that Zer0’s head is called n0t-can0n, so take that with a grain of salt. Best of all, the additional mission featured isn’t a 30-minute story with Grandma Flexington babbling on and on making you ultimately regret accepting the mission in the first place. It features Innuendobot 5000 requiring you to fetch items to profess his love to the town’s various civilians with the usual innuendo jokes added in. Gearbox poking fun at what Zero might be behind his mask. All in all this Head Hunter pack gets a score of three stars out of five.